Sometimes too much choice can be bad. But sometimes it's exactly what you need. We're often told that having choice is always and absolutely a good thing. The fact that we're told it most often by politicians should be a clue that this is irredeemable nonsense. In fact, thanks to a 2000 paper called When Choice is Demotivating: Can One Desire Too Much of a Good Thing? by Sheena Iyengar and Mark Lepper, we know it's nonsense. You might have heard of it by its more colloquial name: the jam experiment. In this study, the researchers tested how shoppers responded to choice. Given a selection of 24 jams, just 3% of shoppers picked up a jar. Narrow that choice to a more manageable six, and suddenly a third of the subjects in the test picked a preserve. The authors concluded that people can suffer from "choice overload" - that when you're presented with too many options, you freeze up, unable to pick between them. It follows then that if a company wants people to buy its products, it actually shouldn't follow the classical free market teachings of offering a broad, diversified range. Keep it simple, or the customer might well turn away in frustration before they get anywhere near checkout. There is a parallel with Apple here. The accepted rhetoric is that when Steve Jobs rejoined the company in 1997 (after being ousted in 1985 by then-CEO John Sculley), his most brutal but vital act was to rationalise the company line-up by cancelling projects and ditching products. In the 90s, Apple had reacted to the threat of the PC by introducing a bewildering range of Macs and peripherals. Some specs only differed from others in the range of software that was bundled with them, despite having quite different product names. It was a mess. Even though Gil Amelio is often blamed by the Apple faithful as the man who almost killed it before Jobs swept back to power, it's clear even from the video he shot just a few weeks into his stewardship of the company that Amelio too realised the mess needed clearing up. So it came to pass that Apple offered just a few products each in just a few configurations, albeit often with build-to-order tweaks you could make after you'd picked the basic package and didn't mind paying bloody hell how much? for a couple of extra sticks of RAM. One of the reasons I personally tend to buy Apple stuff is that choosing is easier because there's less to choose from. I know I want a computer running OS X, so unless I want to muck about with Hackintoshing again, I have to buy something from Apple. And I am happy to do this not only because Apple makes great computers, but also because it saves me from having to visit PC manufacturers' websites to wade through screens of opaque hardware configurations, and endure meaning-free inspirational quotes set atop stock photography. This received wisdom became so ingrained that when Apple introduced the Apple Watch, which all-told comes in 34 models, the reaction from some was once again to invoke Jobs. Apple produced dozens of models when Jobs wasn't in charge and it nearly brought the company down, their thinking went. No sooner is another not-Jobs CEO in charge but they start making the same mistakes again. Apple is Dooomed! To deride this kind of thinking as primary-school level is to woefully underestimate the cognitive abilities of the average 10-year-old. You simply can't say that a strategy that works for a laptop also works for a wearable. These are products in different worlds. Wearable devices are much more intimate, personal things by their very nature, and if Apple had just introduced, say, even one from each of the three lines in the 42mm size, it would have made it much easier for many more people immediately to dismiss it as not for them. What's more, it's clear from Apple's charm offensive that the Apple Watch is as much a fashion and lifestyle item as it is a technology one. That's entirely in line with its philosophy for all its devices - Jobs used to say that Apple stood at the intersection of technology and the liberal arts - it's just even more explicit with the Apple Watch. Apple isn't going to suddenly start producing 19 different laptop lines. 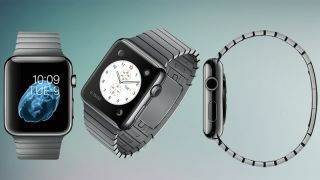 Having 34 Apple Watches is simply about treating different categories of devices differently. Hindsight might come to prove me comically naïve, but with any luck you'll have forgotten everything I said here, except perhaps the bit about jam.